The Silicon Vertex Detector consists of three layers of silicon sensors. 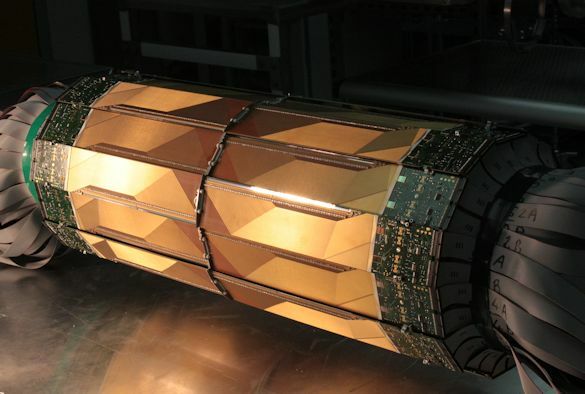 It has almost five million 'pixels' and is effectively a 3d 'camera' looking at antimatter annihilations. Scientists from the University of Liverpool as part of CERN’s ALPHA collaboration have made the first spectroscopic measurement of an atom of antimatter — a longstanding goal in antimatter physics. Published in the journal Nature, this finding represents a significant step towards the development of highly precise tests of whether matter behaves differently from antimatter. A major question in physics is why today’s Universe seems to consist almost entirely of ordinary matter when the Standard Model of particle physics predicts that there should have been equal amounts of matter and antimatter after the Big Bang. Atoms can be excited by firing light at them, and when they return to their ground state they emit light the frequency distribution of which forms a spectrum that can be precisely measured (spectroscopy). However, antimatter is difficult to produce and to trap because it annihilates on contact with matter, which makes measuring its properties challenging. Recent advances at CERN’s Antiproton Decelerator have allowed researchers to trap and measure antiprotons and antihydrogen. CERN’s ALPHA collaboration – which includes Physicists from the University – magnetically trapped atoms of antihydrogen in a cylindrical vacuum chamber that is 280 millimetres long and has a diameter of 44 millimetres. They shone a laser light through windows in the chamber to measure the 1S–2S transition of the anti-atoms (the transition from the ground state to an excited state). The paper reports that the transition frequency of antihydrogen is consistent with that of hydrogen. The spectrum of hydrogen has been characterized to high precision, so improvements in antihydrogen spectroscopy should yield highly sensitive tests of matter–antimatter symmetry. 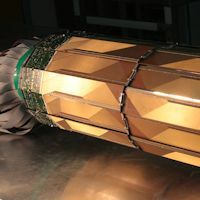 Researchers from the University’s Department of Physics designed and fabricated the silicon vertex detector – one of the main tools in the ALPHA experiment. This detector is able to ‘see’ inside the ALPHA –apparatus and it detected where and when single annihilation events took place. Petteri Pusa, who is leading Liverpool’s ALPHA operations at CERN, said: “We managed eventually to collect majority of the experimental data in fairly short period of time as we recently significantly improved the antihydrogen production rate”. The paper `Observation of the 1S-2S transition in trapped antihydrogen’ is published in Nature.